Get money saving deals when you buy Heinz products online and instore. 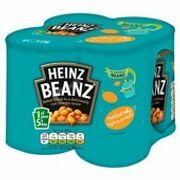 You can purchase cheap Heinz food products from reputable UK retailers including Approved Food, Waitrose, Tesco, and Boots where you can save as much as 25% on selected items. Heinz products include salad dressings, ketchup, spaghetti sauce, mayonnaise, pepper sauce and more. Here at Latest Deals, we will provide you with the best cheap Heinz UK voucher codes that you can use to get big discounts. You can also save a lot of money when you buy in large quantities or in product bundles. Heinz Soup of the Day Thai Carrot & Coconut 400g - Save 83%! Get the best savings on Heinz products with the help of voucher codes here at Latest Deals! Imagine the world producing ketchup without Heinz. Well, you cannot because it is impossible. Indeed, ketchup is Heinz and many would definitely agree. It is commended both for its flavour and design. These are only some of the reasons why many embrace the product. What makes this brand preferable is that it uses authentic tomato ketchup. Once you crave it, it is impossible to find a substitute. Ketchup, comparable to many other great foods you probably know, came about to preserve harvest. Since then, various techniques were witnessed in food preservation. Indeed, it is constantly evolving. In the year 1906, the Heinz company finally perfected a delicious, safe and preservative-free ketchup that was sold in a clear glass bottle. This was far from the ones produced by their competitors in opaques. They started doing such so that they can display the pure and red color of ketchup. Heinz has gone a long way from just merely being a ketchup company. Today, it produces other products too like soup, beans, pasta, ketchup, mayonnaise, salad cream, barbecue sauce, among others. The brand is a pioneer when it comes to genuine ketchup. 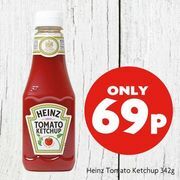 If you think this comes with a price - worry no more because there are many deals for Heinz you can check online so that you can purchase one without compromising your budget. Learn more about this by looking at what the internet has in store for you. This should not be difficult these days with the many affordable features around. Where Can I Find the Best Heinz Deals on UK Online? If you are looking for Heinz tomato soup, beans, pasta, ketchup, mayonnaise, salad cream, barbecue sauce, chilli sauces, and others, Latest Deals got you all covered. Take advantage of amazing deals and savings from Heinz baked beans price Tesco and use the discount sales, voucher codes, price drops and freebies we offer exclusively to our members. Our team of money-saving experts and community of bargain hunters regularly verify and share affordable Tesco Heinz beans and many more. Enjoying the cheapest groceries becomes possible without hurting your wallet. Most of our discounts are from the most credible UK retailers such as Amazon, Approved Food, Boots, Farmfoods and many more. Approved Food. Check the Sale category of Approved Food and stumble upon the enormous amount of discounted Heinz products it has to offer. From Arrabiata sauce, mustard, pasta sauce, biscotti, tomato ketchup, mayonnaise, spaghetti bolognese, salad cream original, bearnaise sauce, to pepper sauce, condiments, pasta shapes, among others - these are all available from these retailer. 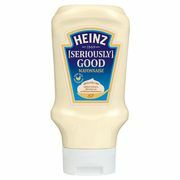 Save up to 80% on their wide range of Heinz products. Boots. Take advantage of the full range of Heinz for baby at Boots. You can save up to £1.50 as you buy Heinz All Ages Farley’s Rusks Banana, Chocolate Biscotti Snack and Rusks Original. Aside from these, you can also buy Smooth Baby Rice First Food, Peachy Multigrain, and Apricot Porridge by Heinz from Boots. Check on this unique offers. Tesco. When it comes to providing the best deals for kitchen, Tesco does not disappoint. The retailer has great deals like 3 for £3 and 3 for £2 on select Heinz products including tomato sauce and baked beans. Tesco updates its site with the best offers regularly so check on that to save more from your purchase. Waitrose. Get two Heinz tomato ketchup and own the second half of its price for less than £2.00 from Waitrose. Aside from this, you can also buy 3 packs of Heinz Baked Beans for not more than £3.00. All of these are offered by Waitrose, alongside with its many other discounted grocery products waiting for you. Check on this retailer and save up to 25%, ⅓ or half-price from your purchase. There is more to Heinz than the myriad kinds of ketchup it provides its consumers. Here are the other products you can enjoy from this brand. Soup - Since its success, Heinz never faltered in making new flavours to its range of cup soup. This new introduction is safe as it does not add sugar. Regardless, you would still enjoy the Heinz taste you surely know. Make this one of your protein sources. Beans - Aside from its ketchup, Heinz is also famous for its beans. Hence, it has taken seriously the production of its beans dishes all over the world. Apart from the flavoured ones which are simple to buy, you can also look for a can which is safe for those who are dieting. 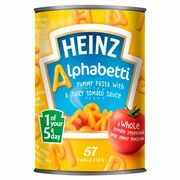 Pasta - From hoops, alphabetti & numberetti, dry pasta, pasta sauce and shapes, Heinz may help you on that and more. The twist about this pasta is that it has a squeezed of tomato in it. You can also be assured that there is no preservatives or artificial colours added on this product so you can still enjoy it without risking your health. Mayonnaise - Upgrade your mayonnaise with the features from Heinz. All the expertise of this manufacturer is applied on this so that you can enjoy your favourite foods includings jacket potatoes, sandwiches, salads and chips even more. Made from a broad range of eggs that are natural, make the most of a bottle without compromising quality. Condiment Sauces - These deliciously creamy sauces are a combination of important ingredients plus chives which are ideal for steak and chicken. Most of these are available in a Top Down Bottle which is also convenient to have in your meal. The company launched a baked beans cafe in London to mark the 50th anniversary of the "Beanz Meanz Heinz" slogan created in the 1960s. Heinz Reduced Sugar Ketchup. Compared to the classic, traditional Heinz ketchup you have become accustomed to, this recipe is of 75% less sugar. Hence, it has allotted most of its attention in including a 100% of rich tomato in its flavour. Almost synonymous to all the varieties of Heinz Ketchup, this one does not have any artificial colours, preservatives nor flavours too. What is even better is that its top-down bottle, and stay-clean cap make the use of it even easier. Heinz Tomato Ketchup. This original tomato ketchup is responsible for the popularity of Heinz as America’s favourite ketchup. Apart from the genuine ingredients it is known for, this is also made of top-down bottle with a stay clean cap that benefits many consumers too. This kind of packing is an innovation Heinz pioneered at. Heinz Hot & Spicy Ketchup. When it comes to spicing up your fries, burgers and sandwiches, this Heinz Hot & Spicy Ketchup is definitely the answer. This new added kick is brought to you by the TABASCO pepper sauce. Its inclusion to the classic Heinz Ketchup we have grown to love is indeed fantastic. Squeeze this with its easy to-down battle and stay clean cap. Just be cautious because yes - it is extra hot. Heinz Ketchup Blended with Balsamic Vinegar. Instead of using the usual white vinegar, this Heinz Ketchup Blended with Balsamic Vinegar is known as the blend of the both instead - ketchup and balsamic vinegar. This is sophisticated and a new twist to how you take the typical ketchup in your meal. Heinz Dip & Squeeze Ketchup. The Heinz Dip & Squeeze Ketchup is a new inclusion to the line of Heinz Ketchup that you are used to love. The package this offers is three times way better than that regular packets you are familiar with. This is convenient and easy to employ. If you are one who needs to grab quick lunch, this will surely work for your lifestyle.